Trujillo is a desert city of about 1 million people, living primarily in slums. There were about 40 people with us and the main group stayed and worked here for the duration of the trip, but my team was only in Trujillo for the last two days of the trip. We worked mostly in Bagua, a poor town of several thousand, and in Chiri Yaco, a small village in the Amazon jungle. 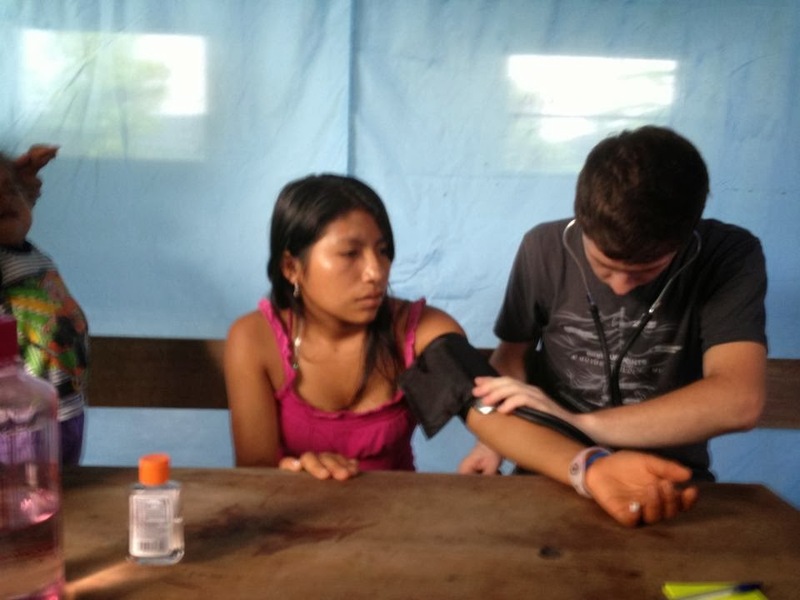 Our group was there to provide medical clinics and spiritual counseling. We spent 6 or 7 hours in clinics each day. In both Bagua and Chiri Yaco there was a strong church presence and we had many church volunteers who we used to fill out the questionnaires for the patients, asking about their top ailments or medical complaints as well as religious affiliation. Once patients had been seen by the medical staff, we organized any medication to be given to them while they were moved to counseling. We would ask about whether they attended church, and whether they knew Christ as their Lord and Savior. We shared the gospel with many, and prayed for families and loved ones, sicknesses and relationships, work and social problems. We also attended many local church services, sharing our testimonies, our leader preaching, and myself singing a song or two in Spanish. There was a group of about fifteen children, mostly around 5 to 10 years old. One of us would be taking care of them, trying to keep them quite when they were in the clinic, or playing with them outside. I was with them pretty frequently because I could speak Spanish. I talked with them and they poked around and asked me questions about myself or America, like what my tattoo was and how to pronounce different words in English. They taught me several games of theirs and I taught them a few American games, like Red-light, Green-light and duck, duck, goose. Unfortunately, I couldn't remember the words for duck OR goose, so naturally I called it Pollo, Pollo, Perro. (Chicken, Chicken, Dog is a better name for the game anyway, right?). So if you ever go to Peru and find kids playing Pollo, Pollo, Perro, I started that. At first, the reason I went was really just that the opportunity presented itself and I believed it would be a good experience; for me and for my record. However, as the time drew closer and my financial need for the trip wasn't met, I had something of a breakdown. I was angry at myself for not working harder, raising more, and I guess at God as well, for making it so hard. But after a while, when I had exhausted all my perceived options, God told me that I honestly wasn't going for me. It wasn't to show that I liked doing charity or to see a foreign country. He told me I was going in order to praise Him. He was going to teach me how to praise, and teach others with me. I started out wanting to go for the medical experience, but ended up most changed by the simple act of meeting so many great believers who helped me understand what it was to praise and honor God. The sights, sounds, smells, people, none of it was really surprising. At least, none of it was unexpected. I knew I was going to see many impoverished and malnourished people. I knew I would be immersed in a foreign culture. I knew I would experience worse living conditions, different food habits and beliefs. What surprised me was how affected I was by these things. As I traveled through towns on buses, looking out at the shacks plastered with graffiti, or at people bent over in the rice fields, I felt the intense difference between myself and these people. But at the same time, God impressed upon me the sameness that we shared. As I talked with patients about their problems or about Christ, I heard many of the same kinds of difficulties, excuses or prayers as I would have back home. As I sat in a circle of people in the dark, early morning, looking out at the mountainous jungle surrounding us, I felt amazed that a Kansas boy could be in a place like this, with people like these. It was all I knew it would be, and everything I didn't expect. I would definitely love to go back to Peru, and while I don't expect to go again this summer, I am currently planning on going back next summer. I made so many friends, both from the Americans and the Peruvians, that I just can't imagine not going back to see them. Otherwise, when I get my medical license, I definitely want to be at least a part time medical missionary, whether it's for just a few weeks a year or a few months.